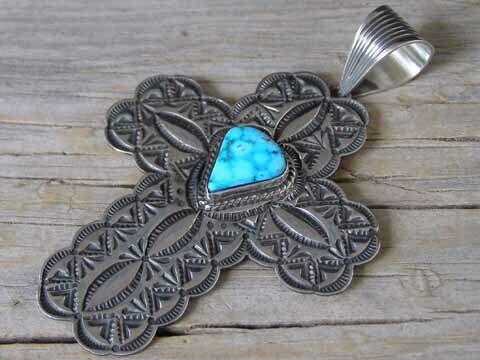 This beautifully stamped cross pendant by Navajo silversmith Tsosie White is set with a teardrop of natural, untreated Kingman turquoise from Arizona. The stone is set in a smooth bezel wrapped by twist wire. Dimensions of pendant (excluding bale & jump ring): 2 5/8" x 2 1/8"